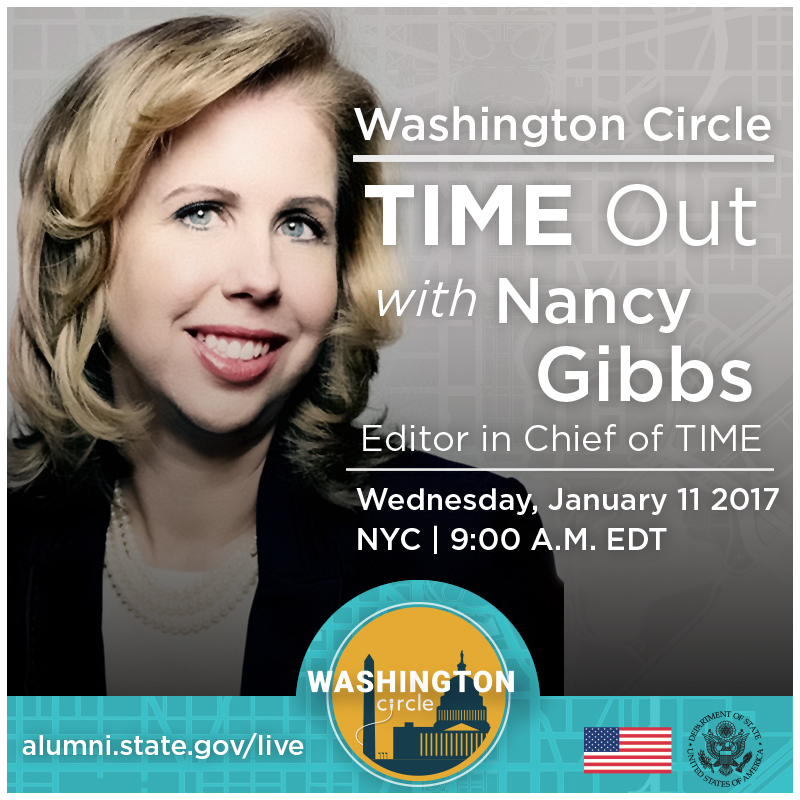 This January, TIME Magazine Editor in Chief, Nancy Gibbs sat down with Washington Circle to share her experiences working at TIME magazine over the last 30 years. She examined the role of social media in the news, gave advice for future journalists, and explored the challenges women face in journalism. Washington Circle is a web-based talk show that connects alumni of U.S. government-sponsored exchange programs with experts, senior government officials, and public figures to discuss issues that matter in their communities. 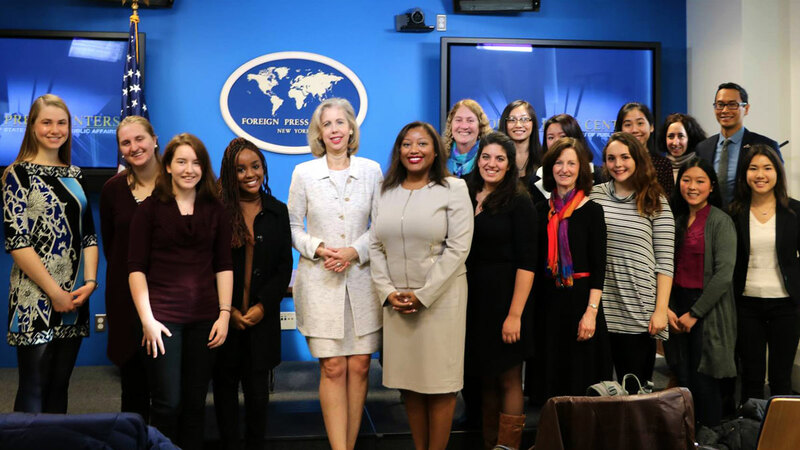 The event was hosted in the Foreign Press Center in New York City in front of a live studio audience and an online audience of exchange alumni, including viewing parties in Cuba, Ethiopia, Israel, Nigeria, Canada, Guatemala, Pakistan, Korea, Kenya, and Nicaragua. Alumni at these viewing parties joined the conversation via web chat, and through social media using the hashtag #AskNancyGibbs. When asked about gender diversity at TIME, Ms. Gibbs espoused the importance of having the most diverse group at the table—whether that diversity come from gender or something else, like attitude, interest, or life experiences. She mentioned that many of the correspondents in hazardous posts or at the front lines reporting on conflicts were “talented, fearless, enterprising women” in their 20s. The audience expressed concern about the prevalence of “fake news” and the perception that news agencies give time to all points of view, valid or invalid. In response, Ms. Gibbs asked a fundamental question: who has the authority to be arbiters of fact? She stated that in a world where “nothing stays unreported anymore,” there need to be sources that people trust and that have higher standards for reporting. Social media can help or hurt this message; social media can amplify the messages in traditional media to a much wider audience, but it can also challenge the authority and expertise of traditional media sources. Ms. Gibbs also said that the fundamental challenge of “fake news” is that it looks very much like real news, and the proper way to combat this false reporting is to establish news literacy in youth and teach consumers to distinguish reliable sources from unreliable ones. When asked what she hopes to accomplish with TIME, Ms. Gibbs responded that she believes that traditional media have obligations beyond reporting major stories: they need “go deeper and broader and look beyond the traditional makers of news.” She highlighted the TIME feature Finding Home, which embeds reporters and photographers in refugee camps in Greece to tell the stories of four women who gave birth while fleeing Syria. Ms. Gibbs concluded the discussion with advice for aspiring journalists. This is a golden age of journalism, she said, with a perfect combination of appetite, audience, and opportunity for journalism. If journalists find a good story that matters, the ability for quality to find its audience is now.